Mutual fund investors continue to pull money out of stocks and put it into bonds, according to the latest data from the Investment Companies Institute. 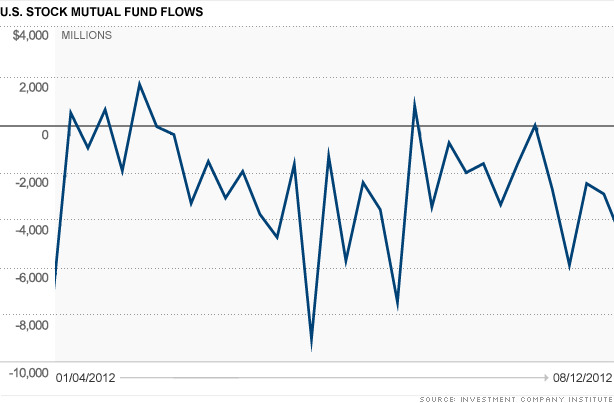 In the week ended Aug. 22, mutual funds that focus on U.S. stocks had an outflow of $4.48 billion. Investors also pulled $1.4 billion out of funds that invest in global stocks. Through the end of July, investors have pulled just over $60 billion from U.S. stock mutual funds. By comparison, those same funds lost roughly $40 billion during the first seven months of 2010 and 2011. The last time investors were willing to put money into stocks was during the last week of May. While August is usually a quiet month, trading volume hasn't been this low in August in 5 years. As has been the case for awhile, the outflows from equity mutual funds coincided with inflows into mutual funds that buy bonds. Bond funds had an inflow of $6.83 billion last week as investors remain enamored with the safety of fixed-income assets. In another well-established trend, money continued to flow into hybrid funds, which invest in a combination of stocks and bonds. These funds had inflows of $2.41 billion for the week, up from $953 million in the previous week.